Wednesday, I went in to have my final physical and blood work done for the challenge. I had to fast from Tuesday night until Wednesday at 12:15. (wow, did I miss my morning coffee! )…I got into the room, the phlebotomist came in, who was soooo excited for me. 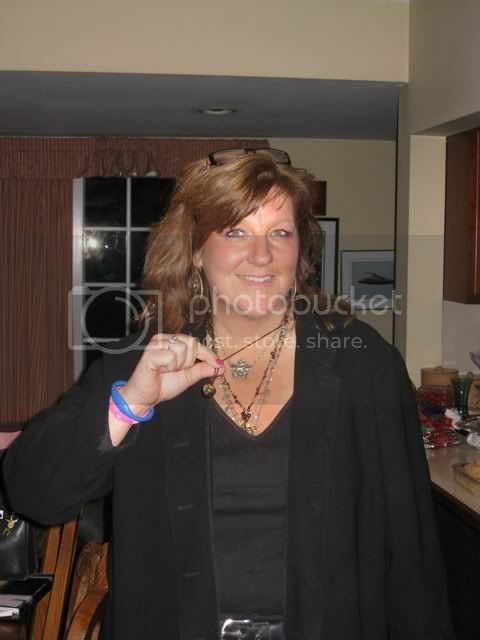 She is a beautiful woman who has just lost over 57 pounds herself doing the P90X program. She is so fit and so nice….and she was so excited for me as she took my blood, did my EKG, which she said looked amazing, and told me twice during the time that she was with me, just how proud she was of me and how great I looked. According to their scale, I was also another 4 pounds down since my final Dr. Oz weigh in! It was a great feeling to be at a doctors office, expecting to get great results. And it was really special to have such a fit, medical person say that she was proud of me. Then my doctor came in, she was really excited to hear that I had made it to the finals, and she looked over all of the paperwork that she had to fill out for the challenge, and then proceeded to do a thorough exam so that every part was filled in. As she looked at my EKG, and then took my blood pressure, etc…she was filling out the paperwork and just saying how proud she was of me. At on point she said, “you have the heart and blood pressure of an athlete!” Those words really overwhelmed me. I was a real athlete in school, but that was over 30 years ago (my high school 30 year reunion is actually next week). So, after working so hard in all of the classes at the gym…interval training, weight training, spinning, rowing, etc…to hear that after around 4 months of real workouts at a gym, that I now have the heart and blood pressure of an athlete, was truly amazing! What a gift! After a very thorough exam, with my wonderful doctor filling out lots of paperwork, making sure everything was in order for me, I left, walking to my car with such a smile, and such gratitude. I just came from an office where everyone joined me today in this exciting place and time. They spent so much time with me, making sure everything was in order with the paperwork, doing a thorough exam of every possible thing, and just making me feel sooooo great about all of the numbers and results, explaining to me what they all really meant, and showing me in my folder, how far I have come in fitness and health. Of course, as you begin trying to lose weight, it starts off as being all about the number on the scale, and that is still very important to me at this point, but to get to a point of understanding and seeing the important numbers from your doctor improve to a point where your doctor is astounded…..WOW! I can’t wait to see the new blood results since my last one’s in February. (I should know by Friday). In February, my triglycerides had already come down 51 points! And all of my cholesterol levels were in a great place. Even my blood pressure was great….now it’s the blood pressure of an “athlete”, wow! Today, Thursday, I did a spin class and wore my heart monitor and pushed it hard, to a number I had never seen before, and then saw my heart go down, back to a resting place even faster than it had before. Another amazing accomplishment, as it shows that my aerobic heart function has really improved. These are all of the “off scale victories” that Elyse points out at the WW meetings. She tries to get through to all of us, that if you are doing all of the right things, the scale will eventually catch up, but don’t get so stuck just on the number on the scale. Take it as feedback, not failure. There are so many other things you have to look at as you know you are becoming more fit and healthy. From clothes fitting a little better, to seeing ankles for the first time, moving a belt one notch smaller, breathing better, sleeping better, getting through a workout a bit stronger…to all of these amazing numbers getting better and better. One small change at a time, one small choice at a time leads to one small victory at a time. I went to rowing class last night, and the owner of the gym was there, and it was great to share all of this great news with him. I rowed a lot harder last night in the intervals, just to see how hard my body would push. When I started this challenge last October, I never even dreamed of trying anything like this. In October, I started out, just like Dr. Roizen and Dr. Oz said, just walk 30 minutes a day. That’s all that I did in the beginning…. and this is all what that has lead to. As I am in the last weeks of this challenge, praying to make it to the end, and still envisioning standing next to Dr. Oz, and having the opportunity to thank him and everyone who created this challenge, because it has changed my entire life..I am amazed at how far I have come. I knew the final number on the scale would be a big factor for me, I never imagined how incredible it would feel, to be at my doctors office and see and experience medical numbers and results that showed such amazing improvement, and actually put me in the category of “an athlete”. Continuing to walk in these amazing on scale and off scale victories, with such gratitude and awe! I’ve learned so much. The Final Process of the Dr. Oz Transformation Nation Challenge…Easter Sunday and the week following…. Going into the weekend, I was overwhelmed with the thought of finalizing a 400 word essay which would be used to narrow me down in the challenge. How could I possibly give all the people deciding who should be narrowed down, just a glimpse of this incredible journey and all of the stories and “God-incidences”? Easter, rewriting and putting more personal things of my story in the essay, and upon waking up on Easter morning, I read his version. It was wonderful. I couldn’t believe he stayed up until almost midnight working on making my essay wonderful, with a more personal feel to it. It is so hard to share this journey in just 400 words, but I used the suggestions of close friends, and did the best I could. Going into Easter, I could barely focus on anything except finishing the strongest that I could. My amazing husband shopped, planned, cooked and took care of EVERYTHING this Easter. I think that I just about found the time to set the table the night before, but I knew that he had everything under control, and just kept supporting me, encouraging me and loving me right up to the last weigh in, helping with so much around the house and with the kids. He’s extraordinary….I am blessed beyond words! Easter morning, we all went to church. Waking up that morning, I was really excited to put on some new clothes picked out this past week. Elyse always says in the ww meetings, “the world gets brighter as we get lighter”, and this was a brighter Easter morning for me this year. As I posted earlier in the blog, last Easter I was watching the service on a computer from California, so excited to see Olivia and a few of the biggest loser contestants…I listened to their incredible inspiring stories, but was so sad for myself. I remember just crying in bed, watching and praying and asking God to help me get the motivation and knowledge and strength to do what they all accomplished. I was in California for Easter, where the weather was hot and beautiful, and I was getting up to get dressed in a dark suit, which hid the body that I was ashamed of….heading to a church service where all of the “California girls” were going to be in little fabulous, cute dresses, sleeveless of course! Very very depressing. So, here we are, a year later, and although I am not in a cute sleeveless dress, YET, I am halfway there. I still have a ways to go, but I am heading into church this year over 57 pounds lighter, much more fit and stronger, feeling much lighter, with a new hope that didn’t exist at all one year ago. It was wonderful to see everyone at church, and really nice to receive so many beautiful, heart felt comments from so many people. It was nice to take a “break” from the challenge for the day, and just enjoy being with family. The only hard part of the day was that my mom didn’t feel well, and couldn’t join us for dinner. I’m just praying so hard that she can be healed and feeling better after all that she has been through. We had so much to be thankful for, though, as we prayed at the table, not only for my journey, but also… my son’s band,“The Walking Tree”, was picked up by a Christian record company..they will be touring this summer, and their first CD was released on the internet to be bought. My nephew, who lives with us, found a college that has the exact program that he was looking for, and he and his brother will be attending there together next fall. My daughter is ending a wonderful first year of high school, and continues to get ready for all of her recitals for dance, singing, piano. It’s been exciting to continue to support one another in each of the amazing journeys we are walking through. Continuing to just pray for the Lord to lead each one of us, according to His will and His best plans for each of us. Monday morning, April 9th, was the date that has been on my mind since the day I signed up for the challenge. On my calendar, I put a huge star on the box for April 9th, with the words, “Last Weigh in, Dr. Oz, You did it…” I wrote this when I signed up in October, and couldn’t believe I was waking up to the actual day. It was almost surreal. I spent the day working on the final changes to my essay, making sure that all of the sections were checked off for the Dr. Oz challenge, choosing the before and after pictures that had to be sent, and stressing over sending the final choices to the Dr. Oz people. One last time for a few friends to look over the final essay and pictures, and then my husband and I just prayed and hit “send”. Leaving it in God’s hands, again. Tuesday, April 10, Got up, went to zumba class at the gym, and when I got home and checked my email, the first amazing email came through…” Congratulations, You are one of the 200 Dr. Oz Transformation Nation Finalists”. I screamed with excitement!! I couldn’t even breathe! Clicking on it, it took me to another page where, right away, they wanted the essay (which, thank God, I already sent), along with the pictures, and then a 12 page packet that had to be filled out and faxed and soon as possible. I filled it all out, my husband helped me with all of the info, and then we took it to be faxed. Everything was sent in….and we left it in God’s hands, again. I spent the next hour or so, telling friends and family, putting it on the blog and on facebook, and the emails of support coming in were just the best gifts ever! Thanks to all of you! We had tickets to Godspell Tuesday night, a great way for my husband, the kids and I to celebrate this amazing first step. We realized on the train that the chance of being chosen as part of the 200 finalists, when 1.2 Million people signed up for the challenge, is a .00016 chance. AMAZING!! We were on the train just in awe of getting through this first cut. Again….only God! We all enjoyed dinner and the show, it was such a wonderful gift to share the night with my husband and the kids. A beautiful night in NYC. When we got home around midnight, there were 2 messages from a producer at the Dr. Oz show, asking for me to call. I went to bed so excited/nervous! Woke up in the morning, called the number and left a message that I would be back after my work out at the gym. I prayed before calling the number, and then dialed. The woman answered, congratulated me for making it to the 200, and then she asked if I had time to do the interview… now. I said, yes, and lots of questions began…. I thought it was a great interview, and after I hung up the phone, I was thanking God for guiding me with all of the answers to all of the questions, along with that amount of time to be able to share so much of this journey with the woman calling. She listened and typed the entire time while I answered. I thought I would be a nervous wreck, but it was actually really exhilarating and exciting to share with her how this Transformation Nation Challenge has changed my life. It was wonderful to be able to share so much of the journey with her. She was so kind, and I really felt blessed to be able to have the interview with her. I really hope that I get to meet her one day. The essay is sent, the pictures are sent, all of my numbers are sent, and the interview is over…..again I place it all in God’s hands and pray that I will be narrowed down to the next 50. Another exciting day comes to a close. April 15, Sunday-Still no word yet, but holding onto faith…. As I sit here on Sunday afternoon, I am holding onto faith that the Lord, who is the author and finisher, has told me to trust him, and that it’s not over yet. Friday was the toughest day of the entire journey so far, emotionally and spiritually, as I tried to hold onto my belief that I will make it to the end. I kept wanting to look at the “rules” on the website, but the Lord kept saying in my spirit, “don’t look it up, trust me.” I was doing ok for most of the day, but as the time went to around 5, I started to think and worry….what if everyone got the next email notice of being a finalist in the 50 group and I didn’t? I forgot to ask the producer interviewing me, if I would hear either way. I should have asked. Then again, I also had her phone number and could call and see what was going on….but my husband told me to leave it and trust God. Don’t manipulate the situation at all. Trust Him! That afternoon, we went to lunch at Harbor Deli, and while we were on line, I noticed a young man from my church was working there. I told him to keep praying for me, and told him where I was in the challenge. As I shared, others on line heard me sharing, and 2 young children said, “you met Dr. Oz? We love him, my mom watches all the time…” I proceeded to tell them about the challenge and some of the amazing things that has happened on this journey, including having my poster on the walls of the gym. I told them about my blog, and they grabbed a pen and wrote it on their hand, and I also told them to set their dvr, because I would be the one standing next to Dr. Oz on May 23rd. The young girl was very cute, and wrote that on her hand also. The owner of the deli, asked about the challenge a bit more, he was really excited for me, and encouraged me when I left. When I got home, so many friends were calling and emailing and asking when I should be hearing. A close friend called from Pa., and when she asked, I did what I shouldn’t have done….I went to the computer to look up the rules. (Remember….I felt the Lord tell me earlier, DON’T look it up…trust me”. According to the “rules” section on the Dr. Oz website, the next phase of narrowing down to the 50 should be done “on or around April 13th”. My face instantly got sooo hot with nerves, and my stomach began to churn…and I felt myself go into panic mode. I started to think I didn’t make it, I started to question all that I had been through on this journey. I started to think, what if it’s over?…could that really be it? I couldn’t imagine that the Lord would bring me this far, and place such a belief in my heart, and show me over and over again that this journey is so much bigger that me….for it to be over today. The narrowing down from 1.2 million to 200 people happened so fast….over night, and now it was Friday, late afternoon, and no email or notification. We were all trying to figure it out, and I was getting more and more nervous and sick to my stomach…worrying with all of my, “what if’s?” Then, we started to think, 200 people sent in their 400 word essays and pictures, which were due on Wed. night by 6pm. I sent mine in early, which is probably why my interview happened on Wednesday. On Thursday and Friday, 199 other people had to be interviewed, and there were a group of people who now had to take 200 essays, pictures, weight loss numbers and accomplishments, and compare 200 interviews in order to narrow us down to 50 people, and ultimately 10. I’m guessing and hoping that that became a huge job, and they are taking more time to really decide. Which will bring us into next week. My husband and I went to grab a bite to eat, and then got a movie to get our minds off of the worrying. I still had a stomach ache watching the movie, and kept praying and asking the Lord to show me that I was still in it, and to give me faith and take away the worry and anxiety. Before I went to bed, I checked the computer, and there was a message on my blog…..It was from the owner of the deli we went to for lunch. I read it and was absolutely amazed. It said…. I yelled to my husband, and told him what I just read, and just said, “can you believe that he went home after a long day at work and read my blog and then wrote to me and made this amazing offer? Not only was it a special offer, but for me it was the Lord letting me know, “it’s not over.” When I went to bed, I grabbed my Bible and just asked the Lord to speak to me through His word, because I was still falling into being a wreck and didn’t know how I was going to go to sleep with all of this worry on my mind. I didn’t know where to begin to look, and just grabbed my Bible, trusting He would show me, as it has been so amazing, as I have grabbed my devotional and Bible and notes, or put on praise music during this time, the words and scriptures and lyrics have been EXACTLY what I have needed at that exact moment. My Bible fell open to Psalm 91, which was perfect to read through, then I looked around Psalms, reading and found..
Then I looked around the Bible, and I can’t remember where it was, but I read…”sleep in peace, I have heard your prayers.” It was exactly what I needed to hold onto, Warren and I prayed, thanked Him. and I fell asleep right away! Earlier that day, He gave me…. On another note I wrote, Surrender, Trust and wait, do not fear, Live IN this moment, testify to Him. He is the author and finisher. Just the thought, that our faith is what pleases God, made me stand there and smile at the thought of putting a smile on His face…being able to bless Him and make Him happy. So, since the doors opened to the building of ww that morning, I have chosen to walk in faith and believe, and all the fear, stomach aches, and anxiety has left. It is Sunday night, and I have felt a few times this weekend that I was suppose to write all of this down. There’s a lot to be done in the house, and I will get to it next, but I know that I am suppose to keep writing this entire journey down for a reason. I don’t know what it is yet. I have written a lot in this journal, that has not gone up on the blog for various reasons. Maybe all of it will, eventually. I’m hoping and praying that it will be used to inspire others for His purposes, or maybe it is just for my children, family and close friends to read. Either way, I will keep sharing all of this journey through this journal, and see where it leads. Today, I felt as if this journal/blog might be published one day….we’ll see. Only God knows…. Monday, April 16-Another Email from the Dr. Oz show…Yay!!!! On Monday, I woke up hoping and praying that I would hear something more from the show. When I went to my email, there was a wonderful email from a friend which said…. It was the perfect scripture to start my day, before getting up, I went through the rest of my emails and noticed one from the Dr. Oz show. I opened it up, and it was a letter and list of lots of documents to print out, fill out and fax asap to the show. Show releases, medical releases, paperwork for my doctor, a form for a physical, etc. Wow! I knew that no matter what, first I had to head to the gym to work out. Everyone was excited for me there, and the workout was brutal, but I kicked it in full gear, as I want to keep going strong no matter what happens, but would love to also lose even more weight for when I am on the show! After the workout, I came home, Warren printed out all of the paperwork. I’m so thankful that all of this came again on a day where he was off, because he knows how to do all of the faxing, etc. I filled out all of the paperwork that I could, we went to fax it all, and then I took the medical forms to my doctor’s office to let her know that I had been narrowed down, and needed to have another physical and blood work taken, as we both agreed, it could only be better and better numbers, so why not? The earliest they could get me in is Wednesday. The email also said that someone would be calling to set up a 2-3 hour psychological evaluation. The next deadline for everything is April 24th. So, I’m continuing to walk through this with such gratitude and awe….Also doing my best to keep up the exercising and eating right. So thankful that I spent over 2 hours yesterday prepping all of my good food for the week…something tells me it is going to be a crazy week ahead….Also praying that when I go to the doctor, all of my numbers are even more extraordinary than they were before!…as I continue to transform inside and out! Praising God!!! !……I made the first cut…..1.2 million signed up for the challenge, 200 were chosen for the first cut, I’m one of them!!!! Will keep you posted…soooooo excited!!!!!! This morning I woke up early, butterflies in my stomach, wondering how Olivia Ward did her final weigh-in, in front of millions of people. My family was still sleeping, I checked the computer, and at exactly the perfect time, as it was such an emotional morning knowing that this was the final day of this Transformation Nation Challenge, a few encouraging emails came through from friends who knew what a big morning this was. Part of me wished that some of us in the challenge would have taped walking through our final mornings, sharing all that was going through our minds. I didn’t realize how emotional this day would actually be. I walked down the hall and shouted, “it’s the final weigh in!”. I dropped my bags, ran to change into my light clothes, then got ready to step on the scale. My heart was pounding, my knees were weak, my hands were sweating… Jen had the official Dr. Oz paperwork in front of her, and when she wrote down the number, I saw a number that was beyond my wildest dreams…I started trying to calculate the loss for the week, and when she finished with the calculator, she said, “you lost 5.2 pounds!”…I just broke down and cried, and tried to catch my breath, and just said, “Only God!, Only God could pull out a number like that for my final week!” WOW!!!! What an incredible ending for this challenge!! It still takes my breath away as I type this. We filled out all of the Dr. Oz paperwork, I took a picture with Jen and with the paperwork and a sign that I quickly made that said, “Dr. 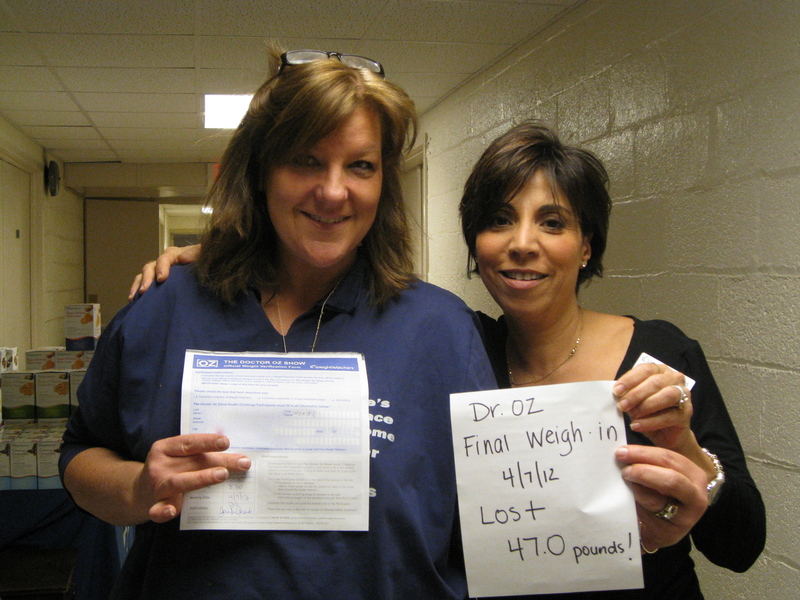 Oz Final Weigh in 4/7/12 Lost 47.0 pounds!”…. My total loss is 57.0 from September, as I lost the first 10 pounds when I put on the “Just 10” bracelet from the Dr. Oz show and began the journey. I changed my clothes, went to sit in the WW meeting and couldn’t wait until Elyse, the leader arrived, to share the amazing news with her, along with the entire group. I know with all my hear, and was able to share this morning, that I never could have done this without all of them. The meeting was about having “anchors” in our lives in order to help us overcome obstacles, and to stay on the weight loss journey successfully….anchors which include people, items that remind us to stay on course, sayings, scriptures, etc. When I think of all of the anchors that I have been blessed with during this journey, they would fill pages! My family, friends, even strangers who have now become friends through this…all of the encouraging emails, scriptures, stories shared…those who have joined me in getting fit and using every opportunity to spur each other on, and a strengthened faith in this journey with a relationship that anchors it all! I sit here adding to a journal that started last October, and I am in total awe of all that has “transformed” in my life, and occurred in this challenge. When I finish this entry, I will be putting my final numbers in the Dr. Oz Transformation Nation Challenge website and will then hit “send”. Then, starting Monday there will by many people working on and deciding who will be chosen as finalists…first cut is down to 200 people, next cut is down to 50 and then down to the final 10. There will be a 400 word essay which I have to write, along with some interviews to get through. I just want to be able to share from my heart with whomever is reading my info or hearing my story, and to be able to give them even just a glimpse of this amazing journey that I have been blessed to walk through. 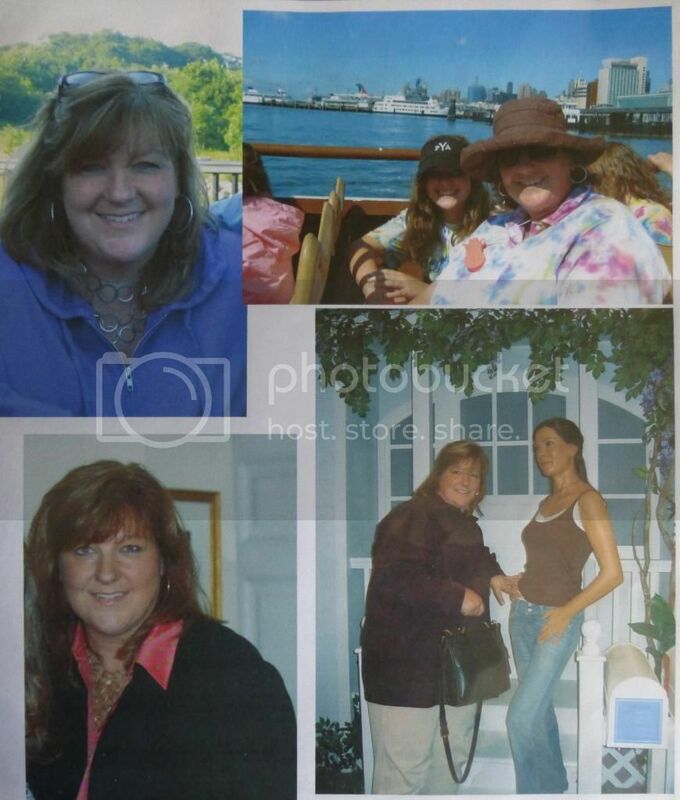 I also want to thank them for creating the challenge, because although I always dreamed of being on The Biggest Loser, I know that I could never have left my family for that length of time, especially with ailing parents who really depend on me. Although the weight doesn’t come off as fast as it does on the BL,(which every day I wish it did), it is the right way to do it and the healthy way to do it, one pound, sometimes one ounce at a time. And, although it would be nice to be on a ranch, and have losing weight as my only job, without any distractions, that is not something that I could do right now, so being able to accomplish all of this, balancing it with everyday life, although very very hard at times…has been amazing..thanks to the support of family and friends, and even strangers! So, as I am placed on your heart and minds in the next few days, please pray that I am chosen as one of the final 10 at this point. I truly still believe in a GREAT God who can do GREAT things. He is the author and finisher of our faith…. and I’m praying that He will bring me to the ultimate finish…. to be standing next to Dr. Oz on the final show when he announces the winner! Thanks again for all of your prayers, encouragement and love. Happy Easter! I’m in the FINAL WEEK OF THE DR. OZ CHALLENGE!!!!! Doubling up the workouts! March 24th- Weighed in at WW and lost another 3.2! I reached the goal that I set for myself 2 weeks early! 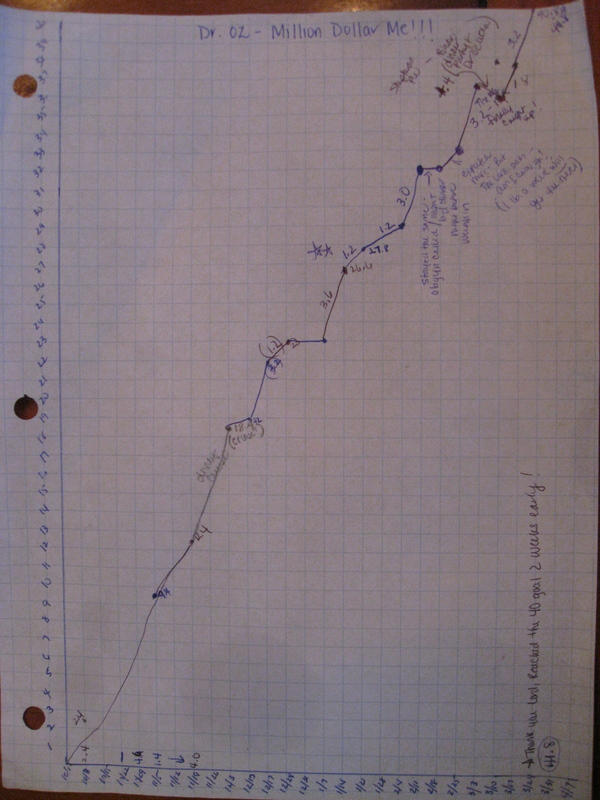 I charted my progress on a sheet of graph paper 27 weeks ago, and at the top was the 40 pound goal. I reached 40.8 pounds today. (50.8 since September). The girl weighing me in actually said that you don’t see numbers like that at this point, especially after losing so much weight consistently.. so 3.2 was a great loss today. I couldn’t wait to call everyone waiting for my weekly call, and email those whom I email each week when I get home. I couldn’t believe it…that email made me feel like some sort of celebrity! Steve, along with his staff, have supported me since the first day Meg and I walked through the gym with our “coupon” to just try it for a week. I was a very overweight woman, filled with fear about walking through those doors of the gym. I remember videotaping myself out in the parking lot of the gym, talking to Dr. Oz, saying that gyms seem filled with perfectly fit people already, and I wished there were gyms for people who had a lot of work to do. I am so thankful that the Lord lead us, and gave us the courage, to walk through those gym doors. I remember everyone at the desk being so kind to us, and making us feel so welcome right away. I remember the very first week, when Steve brought me to tears when he tagged my blog that I had just created for the first time in my life, and put it on the gym’s facebook page. I, still, when I share that story, tear up, as I ask, “who does that?, Who puts an overweight woman on the facebook page of a gym?” These are just some of the incredible moments that I continue to share with others as they ask me about this journey. The night of March 24th, I received another email that took my breath away. A wonderful friend, who is a professional photographer, sent me an email and offered to take pictures of me every week until I reach my goal. She said that she wished she had thought to do this sooner, but was offering to see if it would be something that I would like to do. Again, I felt like I had to pinch myself. First the amazing offer from the owner of a gym, and now a beautiful offer from a professional photographer. How does this happen??? All I can continue to do, is share these incredible stories and end with two powerful words….ONLY GOD! Only God could orchestrate all of this, and as I continue to walk through it, I am just in awe! So, as I now head into the last week of the challenge, and sometimes the fear and doubt start to creep in a bit, especially at the thought that 1.2 million people have supposedly signed up for the challenge….I stop and hold onto all of these incredible “God incidences” which have happened since the day I sat up on the edge of the couch, listening to Dr. Oz launch this challenge, running to the computer to sign up and start the process….I remember having that overwhelming belief that this was going to be the time I could overcome this battle with weight… and I also had then, and have had so many times throughout this entire journey… a full belief that I will be standing next to Dr. Oz on the 23rd of May when he announces the winner. This past Monday, I finally went clothes shopping for the first time since the challenge started 27 weeks ago, October 1st. I knew that I had to go get pants, as all of mine are way too big. I’ve been living in work out clothes, and just wearing everything way too big. (the waist of the pants are rolled over 2 or 3 times under big shirts. So, it was time to get some clothes, as I certainly had nothing to wear for Easter coming up. It took me 4 hours of shopping get some clothes. Mainly, because I had no idea what size I was, and after losing a lot of weight, it doesn’t really register in your head yet. I started out taking 1 or 2 sizes smaller into the dressing room. Then, when I would walk out to get something else, I would realize the pants were still too big. It took a while, but at one point, I was standing in the dressing room with pants on, in a size that I have not been in for 25 years! I thought, maybe it’s just that designer, go get a different pair in the same size…and those fit also….I kept looking at the tags and just stood there for a moment and looked in the mirror and just said, “Wow, thank you Lord. This is, again, above and beyond what I ever could have imagined at this moment.” Each time I have taken off my workout clothes, and grabbed the jeans this week, I am amazed. Yesterday, Jen came over to take some pictures. She had me put on very form fitting clothes, and yes, of course, I had that “third layer” blouse over it… and we went outside in the backyard to take the first group of pictures. She took a few and then said, “ok, the outside shirt has to come off.” It was so hard to do, but she was so amazed, and she continued to click away as she just kept saying, “you look amazing”. It was very difficult for me to take the pictures, but I know that it is important to document every step of this journey, and I am so thankful that she offered, or it would never happen. Again, after she left, I closed the door, and just thanked God for putting it on Jen’s heart to do that for me. So, it is now Wednesday…halfway through the last week of the challenge. When I met with Steve and asked him what I should do to pull out one last big number, he said to double up the workouts for as many days as I can. So each day, Meg and I have done at least 2 workout sessions. In fact, today, I played platform paddle tennis from 8:30-10, then took a Zumba class from 12:30-1:30, and tonight I will take a rowing class from 7:30-8:30. I am exhausted, but excited to finish as strong as I can. As I’m praying and listening reading and thinking about so many things this week, even worrying about getting narrowed down as a finalist…. I am reminded over and over again of all of the amazing moments in this journey so far. As we go into Easter Sunday, I remember that last Easter Sunday I was in California watching our Church’s Easter Service on the computer …as Olivia and some of the other contestants from the Biggest Loser shared their testimony during the service…I was just watching and praying that maybe one day I could get to where they were. That maybe something extraordinary could happen to me, so that I could get motivated and put together all that need to be put together to finally win the battle with my weight. I was in California, about to go to the church service there, wearing clothes to hide my weight, knowing that it was spring, and summer was around the corner..and it would be another season where shorts would not be worn, and cute summer clothes were still something in the distant past. When I signed up for this challenge, I didn’t realize that the final week would be going into Easter week. At first I thought, wow, that’s a strange time to have everything due, and the kids are off for vacation, etc. Then in these past few weeks, I realized.. what better time to finish this challenge…Easter week. The hugest Christian holiday of the year, as we celebrate that Christ had the ultimate victory over death…and I realize that because of that victory, in His power and through His grace I have had victory over this battle with weight. He has been answering my prayers, placing the most incredible people in my life throughout this journey, strengthening me and providing just what I needed when at times I didn’t think I could get through another day, as some of life’s toughest moments and situations happened this past season in our lives and the lives of family and friends. He has blessed me with moments and opportunities that have literally taken my breath away…He has been with me, strengthening me and walking with me through some of the toughest of times on this journey, times where I had to ask for help, and help arrived in ways that I never could have imagined. So, although I’m in the final days of the challenge, I still have a long way to go until reaching my goal weight. I continue to hold onto all that I have learned, and continue to learn from Weight Watchers, Dr. Oz, the owner and trainers at the gym…and continue to watch my body transform…inside and outside! I have shared with many people, I know that I am walking through something that is much bigger than I am. I am so excited to keep watching it all unfold. I know that there are millions of people in this challenge, but if it is the Lord’s will that I am the one, then I will be the one. I’m asking Him for it, praying that He will continue to lead me one day at a time, holding onto the promise that, “I can do all things through Christ who strengthens me.” (Philipians 4:13) and as He is the author and finisher of our faith, I’m holding onto this promise as I pray that He will bring me to an amazing finish…abundantly more than I could ever ask for or even imagine! He has done it over and over again already. Thank you, all, for encouraging me through your emails, letters, phone calls…and especially your prayers. You have inspired me to keep going, and your words and love have been such an important part of my inner transformation. My heart overflows with gratitude! The final weigh in is this Saturday, all of my information is due by April 9th (Monday). Then they will choose 200 people….then we have to send a 400 word essay and they narrow it down to 50 people, then we are interviewed and they choose the top 10 finalists. That is my prayer right now…that I will be chosen in the top 10. Then after that, I will need all of you to vote for me from May 7- May 13th, and pass it on to everyone you know. I will let everyone know how to do that as soon as they let us know. So for now, I am heading back to the gym….going to finish strong for Saturday’s weigh in…praying for the biggest number yet….and then praying to make it to the top 10 finalists! Doing my absolute best…and then placing it in His hands!